Hundreds of pilgrims took a holy dip on Tuesday at Gosaikunda, a famous lake in Langtang National Park, in Rasuwa district on the occasion of Janai Purnima festival on Sunday. An estimated 9000 people bathed at the sacred lake this festive season as the 10-day festival drew to a close today, said Sanjeev DM, Chairman of Gosaikunda Area Development Committee. Hindu and Buddhist devotees from across the country including the nearby districts Nuwakot, Gorkha, Sindhupalchok, Dhading, Kavrepalanchok, Chitwan, Makwanpur, Sindhuli, and Kathmandu valley reached the lake for the annual festival. Amrit Prasad Bolkhel, a visiting devotee, said he came to the lake all the way from Makwanpur believing that his wishes would be fulfilled and his ancestors would be delivered from the cycle of birth and death. "I found Gosaikunda as a holy place," he said. It a belief among devotees that all gods and goddess throng at Gosaikuna on the occasion of Janaipurnima. 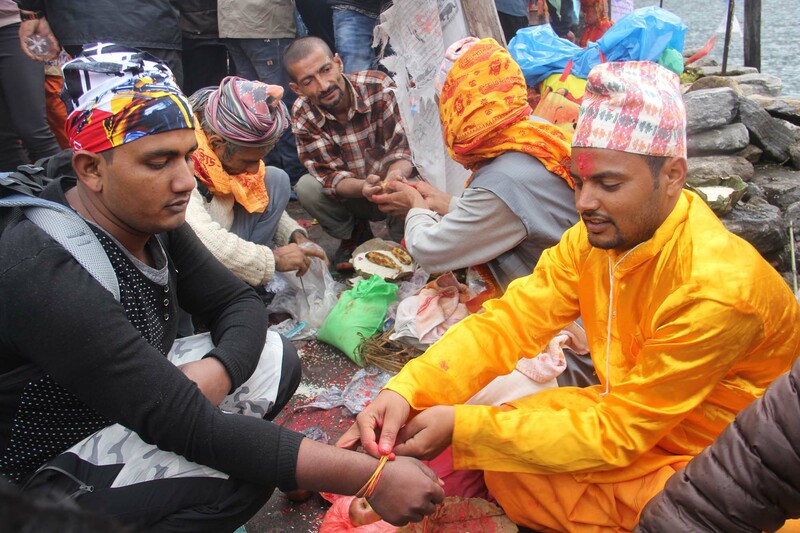 Devotees observed rituals such as tying the sacred threads on the occasion.